Free Shipping Included! 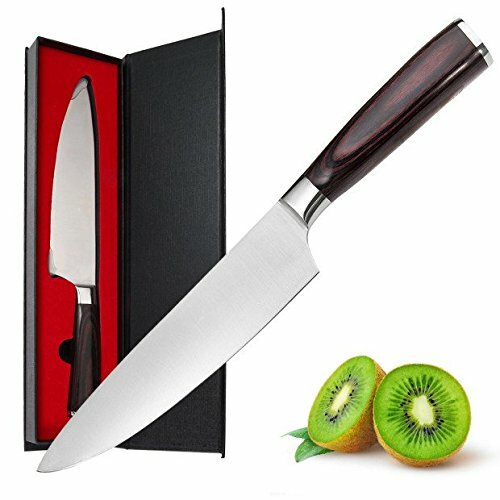 Chef's Knife, ISUDA 8 inch Kitchen Knives with German High Carbon Stainless Steel Sharp Blade & Rust-Free Professional Chopping Knife for Home and Restaurant by ISUDA at Baking Love. MPN: IS-6969. Hurry! Limited time offer. Offer valid only while supplies last. Premium High Carbon Stainless Steel Blade - The ISUDA professional 8 inch chef's knife is made from high-quality stainless steel, The blade is rust resistant and contains 0.6%-0.75% carbon that makes the blade two times sharper and harder than the normal chef knife. The razor-sharp edge, as with German and Swiss knives, ensures that you can effortlessly slice and cut any bread, vegetables, fish fillets, or meat. You will enjoy the world-class blade technology. Durable & Strong Wood Handle - To provides a comfortable grip, minimizes finger fatigue, and enhances balance, This chef's home knife is made from Pakka, which material originates from Africa and its known for its comfort, strength and stability. Multi-functional knife - It is classified and designed to be a multipurpose knife for professional applications. It cuts, dices, slices, chops, and also cuts meat off of the bone, , this stainless steel kitchen knife is your first choice. Lifetime Guarantee & Elegant Packaging - We won't rest until you're completely satisfied with your new Professional Chef's Knife. Our Lifetime Warranty and No Questions Asked Return Policy take the risk out of your purchasing decision and let you focus on the important stuff - food, family and friends. Packaged with elegant box makes it perfect for gift also a great addition to your kitchen. If you have any questions about this product by ISUDA, contact us by completing and submitting the form below. If you are looking for a specif part number, please include it with your message.